So my breakfast adventures continue. You might have noticed a pattern in my posts in the last couple of weeks. I am determined to fix my breakfast issues. For the longest time I have fought the idea of adding more whole grains and reducing the amount of refined carbs that I consume. This change has been in part due to my husband deciding to start a new slow carb diet. At first I thought the whole thing was a little crazy. After two months he has lost a large amount of weight and is doing great. My two boys and I are not following in his dieting footsteps. However, I have started adding a lot more whole grains into our diet, especially at breakfast. Gone are white rice, regular pasta and I have limited the amount of baked goods such as bread that I make with white flour. I have discovered that I love white whole-wheat flour. It is great to cook with and my kids don't notice that they are eating whole-wheat. Last week I tried a new recipe for Banana-Quinoa Waffles from Parents magazine, which looked easy and perfect for a family breakfast. This recipe has 10 ingredients. It takes 1 hour and 30 minutes of total time, 30 minutes of which is active and makes 10 waffles. I was rushed for time when I made this recipe so I omitted letting the quinoa sit in the fridge to chill for an hour or more. Instead I let it sit for approximately 10 minutes and then followed the recipe as written. To make one cup of mashed bananas it took two ripe bananas. I topped the waffles with maple syrup and no berries, since my two boys raided the fridge and ate all the fruit before I had time to make the waffles. They were delicious even without any additional fruit. These waffles only lasted a day in my house. My two boys went back for seconds, thirds and then ate the last two waffles within the day that they were made. I really liked the banana taste in the waffles and the quinoa was great for nutrition and produced a great texture. Overall, a recipe that I would definitely make for breakfast again in the future. 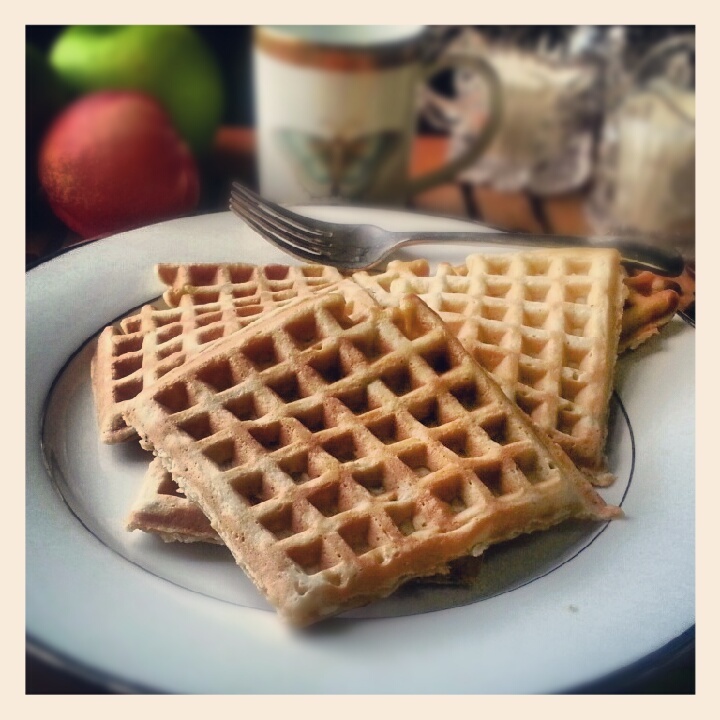 For the recipe go to Banana-Quinoa Waffles. It really is a great grain and can be used in so many different ways! Ooh! Great idea using quinoa in waffles! These look really yummy (and healthy too)! Thank you for linking up at the Harvest of Friend Weekend Blog hop.